Is Overpaying Your Mortgage a Good Financial Strategy? Most people pay the minimum amount due each month toward their mortgage, taking either 15 or 30 years to pay off the loan, depending on the original terms. However, if you can afford to pay more—even just a small amount—it can make a big difference in your finances. One way to pay more money toward your mortgage is to slightly increase your monthly payment by $20-50. Simply add this amount to your check or online bill payment. This method is ideal because it allows you to be more flexible; for example, if you need that extra money for an unexpected expense, you're not committed to paying it toward your mortgage. Another method you can use to pay more money toward your mortgage is to set up biweekly payments. In this scenario, you pay half of your mortgage every other week (this method is especially ideal if you are paid biweekly). Paying biweekly results in a full extra payment per year (26 half-payments per year equals 13 full payments). It's important to note where the extra money goes when you overpay your mortgage. 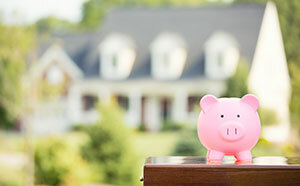 Each mortgage plan applies this money in different ways, which produces different results. If you apply the extra money to your principal balance, this helps you pay off the mortgage faster. However, some companies apply the extra money toward your next payment only, which means that you'll pay off the same amount of money over time. You should be able to tell the company where you want to apply your money, but don't assume that they're doing what you want. When you pay extra toward the principal of your mortgage, you are decreasing the total amount of interest that you pay over the lifetime of the loan. Traditionally, when you make your payments during the first few years of the mortgage, the bulk of your payment goes toward interest rather than principal. Paying extra each month can save you thousands of dollars on your total cost over the full term of the loan. One potential negative effect of overpaying your mortgage is having to pay a prepayment penalty. Certain mortgages have this type of clause to protect the bank from losing money. If you pay your loan off too quickly, you may have to pay extra money to the bank. It's usually still less than what you would have paid if you followed the loan terms. Check with your mortgage company about its policy on prepayment penalties.